Marvin Oliver, ’73, professor emeritus in the University of Washington Department of American Indian Studies and renowned contemporary sculptor and printmaker, is the 2019 recipient of the UW’s Charles E. Odegaard Award, the Office of Minority Affairs & Diversity (OMA&D) announced. The award will be presented at the 49th annual Celebration event hosted by OMA&D and the Friends of the Educational Opportunity Program (FEOP), Wed., May 15, at the Husky Union Building on the UW Seattle campus. Established in 1973, the Odegaard award honors individuals whose leadership in the community exemplifies the former UW president’s work on behalf of diversity. It was President Odegaard’s response to student-led calls for equity in 1968 that led to a university-wide commitment to diversity and the establishment of what is now known as OMA&D. The Odegaard award is regarded as the highest achievement in diversity at the UW. Through his artwork, teaching and community collaborations, Oliver (Quinault/Isleta-Pueblo) has greatly influenced the development and recognition of American Indian contemporary fine art, both locally and across the world. His career spans 40 years and his works have been installed at the UW, throughout the state of Washington, the United States, Canada, Japan and Italy. Oliver also donates his artwork to support UW and community organizations, and has a longtime commitment to the success of American Indian and Alaska Native students. Oliver began teaching art, graphics and design in American Indian Studies in 1974, just one year after receiving his master of fine arts degree from the UW. As a new professor, he started hosting an annual dinner to celebrate the accomplishments of American Indian/Alaska Native graduates during which he presented a custom-made print to each student. The event’s main purpose was to encourage students to persist toward earning their UW degrees. The dinner became known as Raven’s Feast and is now attended by approximately 500 family members, friends and supporters each year. Among Oliver’s renowned works is “Mystical Journey,” a 26-foot-long suspended steel and glass sculpture that is displayed at Seattle Children’s Hospital. His 30-foot orca fin sculpture is the first commissioned public art piece by a non-Italian artist displayed in Perugia, Italy. In 1981, he designed the logo for the UW School of Public Health titled Soul Catcher, a Northwest symbol for physical and spiritual well-being. Oliver created a print for wǝɫǝbʔaltxʷ-Intellectual House when it opened in 2015. “Our House of Knowledge, Graced by Tradition” depicts wǝɫǝbʔaltxʷ along with his father’s canoe. Oliver’s father, Emmett, dedicated much of his life to helping American Indians gain equal access and tools for success. He was the state’s first supervisor of Indian Education and created the “Paddle to Seattle,” an annual tribal canoe ceremony that has grown into what is now known as Canoe Journeys, a months long event attended by thousands. It is largely credited for the revitalization of this specific part of Coast Salish culture. Emmett Oliver was also the first supervisor for the American Indian/Alaska Native division of the Office of Minority Affairs & Diversity under founding vice president Dr. Samuel E. Kelly. In addition to his role as professor, Oliver has served as the adjunct curator of contemporary Native American art at the UW’s Burke Museum. Prior to receiving his master’s degree from the UW in 1973, he received a bachelor’s degree from San Francisco State in 1970. 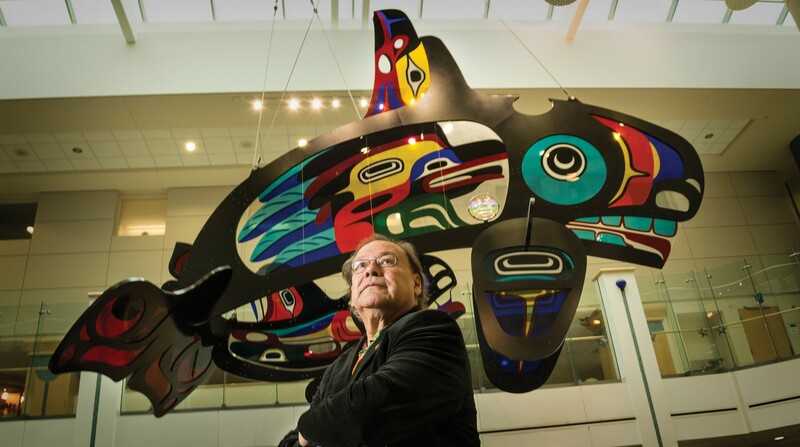 Oliver’s artwork and sculptures have received numerous awards, and he is a previous UW Multicultural Alumni Partnership Distinguished Alumni Award recipient.